Holders TP Mazembe of DR Congo must overcome a 2-0 deficit against visiting Wydad Casablanca of Morocco in the African Champions League. The two clubs meet on Wednesday in the second leg of their tie with the winners progressing to the group stages of the tournament. The losers get a second chance as they enter the draw for the play-offs in the second-tier Confederation Cup. For the first time continental club matches are being played in midweek. Mazembe's French coach Hubert Velud described the club's players as "incredible professionals" when he was hired this year. The clubs also met in a last 16 tie five years ago with Wydad winning 1-0 at home and losing 2-0 away only to be reinstated when Mazembe were disqualified for using an ineligible player. Wydad went on to finish runners-up, the second best showing by the club from the Moroccan commercial capital after winning the 1992 competition. 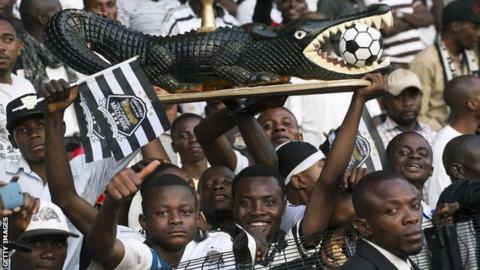 Mazembe have been much more successful, winning the premier African club competition in 1967, 1968, 2009, 2010 and last year. But their African campaign this year has been less convincing. They needed the help of an own goal to draw 2-2 with Saint George in Ethiopia and took 85 minutes to score the only goal of the second leg through a Jonathan Bolingi penalty. "Winning trophies is a habit at Mazembe and you are aware of that although I was not given specific objectives when signing a one-year contract," Velud said. "Continual success in the Champions League is very important to Mazembe because winning the competition secures a place at the Fifa Club World Cup." Wydad coach, twice Real Madrid manager and former Liverpool and Wales striker John Toshack has mixed emotions ahead of the second leg in Lubumbashi. "Our first leg performance was among the best since I joined the club two years ago, but it is likely to be a very different game in DR Congo," he said. "We will be playing on an artificial surface in an atmosphere unique to Africa. What does count in our favour is not conceding at home." Mazembe have yet to find a successor to Tanzania striker Mbwana Aly Samatta, who has moved to Belgium. Mazembe and Wydad are among nine Champions League winners seeking group places and just one of the eight second legs does not involve a title-holder. In other matches, Enyimba of Nigeria defend a 3-0 lead over Etoile du Sahel in Tunisia. The Nigerians lead thanks to a first leg hat-trick from Mfon Udoh, who is the top scorer in the competition so far with seven goals. Mamelodi Sundowns of South Africa hope Colombian Leonardo Castro and Zimbabwean Khama Billiat can transfer sparkling domestic form to Africa as they strive to overcome a 1-0 defeat by AS Vita Club in DR Congo. Al Ahly of Egypt, under former Tottenham Hotspur manager Martin Jol, enjoy home advantage over Young Africans after drawing 1-1 in Tanzania. The other tie sees Al Ahly Tripoli take on Asec Mimosas of Ivory Coast at a neutral venue due to the political instability in Libya, the first leg ended 2-0 to the Ivorians.